After living with it for a while, however, it's fair to say that there is more to Talk than that, and there's some really good moments here, from the haunting opening title track onwards. Three Way Switch is a definite highlight, featuring some nice harmonies over the drum machines that rattle away in the background, but the pick of the lot has to be System which has a lovely chiming guitar riff that keeps going throughout a la Buzzcocks ESP, providing a lovely backdrop to yet more haunting vocals. It really is a good track this one. Another highlight is Secret Space, an ambient, dreamy number with a beautiful melody that brings to mind Low before things veer off in a noisier direction, whilst Tin has some Four Tet-like noodling and harmonies that bring to mind Alan Gill on his unsung early 80s Dalek I masterpiece, Compass/Kumpas. Indeed, the more I listen to this album, the more I can hear the likeness between the whispery vocals here and those of Gill, with Out Of Phase (which misleadingly opens like an early 80s electro number!) being another example. 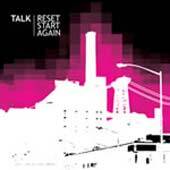 Overall I'd still say there are times when I feel that Talk need to shed some of their Radiohead influences, but I'm glad I persevered with this album as Reset Start Again deserves those repeated listens. They might only be half the band Talk Talk were (sorry, couldn't resist it! ), but if my super sleuth work is correct, Talk are already one of the finest ever acts to come from their part of their world!